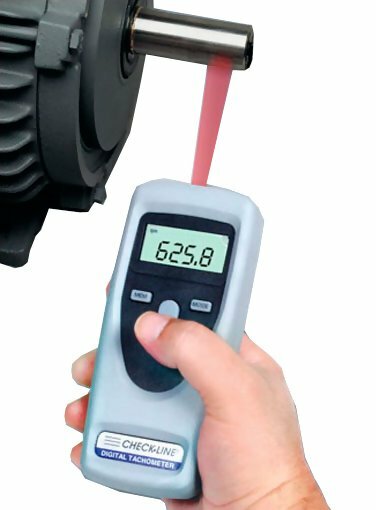 The CDT-1000HD Hand-Held Digital Tachometer accurately measures rotational speed (RPM) using a visible beam of light. The CDT-1000HD can be up to 24 inches (60 cm) away from the small piece of reflective tape that is affixed to the rotating element. The CDT-1000HD's rugged construction, portability and outstanding features make It an ideal choice for maintenance personnel, machine operators or others in a wide variety of machinery and material handling applications. Units of Measure Indicators show the user-selected units of measure. Low Battery Indicator alerts the operator if the batteries are low. On-Target Indicator confirms that the measurements are reliable. Memory Indicators are illuminated when the maximum, minimum, average and last readings are recalled to the display for viewing. 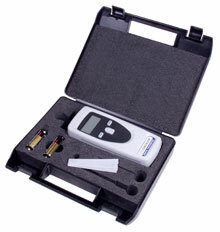 The CDT-1000HD complete kit includes the Tachometer, Reflective Tape, Two (2) AA Batteries (1.5 V), Operating Instruction Manual and NIST certificate -- all supplied in a foam-fitted, hard-plastic Carrying Case.